The HD7000B, is an aftermarket stereo installation kit for 1996 and newer Harley Davidson touring motorcycles including Road Glide models. For a seamless installation of an aftermarket head unit, the HD7000B will accommodate ISO side mounting. The kit mounts into the factory location using original factory hardware and also includes the wiring harness with a provision to retain handlebar controls with the interface (sold separately). 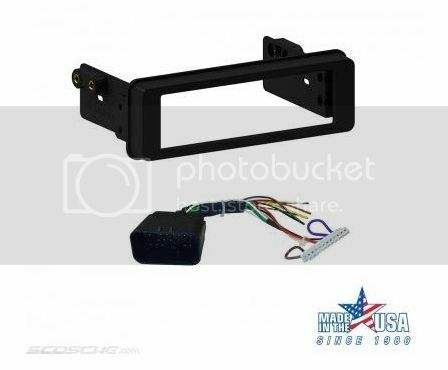 The front panel and mounting brackets are constructed from automotive grade ASA plastic to withstand the elements. The mounting brackets include with factory-style brass threaded inserts. The kit also includes stainless steel mounting screws to ensure durability and simple â€œCustom Fitâ€� installation. The kit includes a weather-resistant gasket for cleaner installation on certain apps and also includes small mounting spacers for Road glide installations. For more information, check out the Scosche website.